- Gradually downsizing my closet. When you rarely get to wear things, you realize which pieces you tend to gravitate towards. So I've been removing all the excess pieces that don't get worn, and taking stock of what kinds of pieces I do wear. I'm trying to keep only things that bring me joy, but I'm also trying to be realistic about each piece's role in my closet. - Realizing that my perfect closet is forever evolving. Just because a piece was right for me two years ago, doesn't mean it's still right for me this year. As I evolve as a person, my style evolves along with me. Trying to hold onto pieces just because I loved them once-upon-a-time serves no purpose, to me, or my closet. And I can't dwell on the pieces I get rid of. - Filling in the gaps. Now that I've gotten rid of unnecessary items, I'm noticing holes in my wardrobe; basic pieces that were missing the entire time but I didn't realize it because my closet had so many other things in it. Now I have a mental list of what pieces I need and when I shop, I only look for those things specifically. All of this to say, the closet gap I've been trying to fill lately is blouses. I have a lot of casual tops but I don't have any summer blouses. Thus, I end up not wearing any of my skirts because I want to wear them with something a little nicer than a t-shirt. 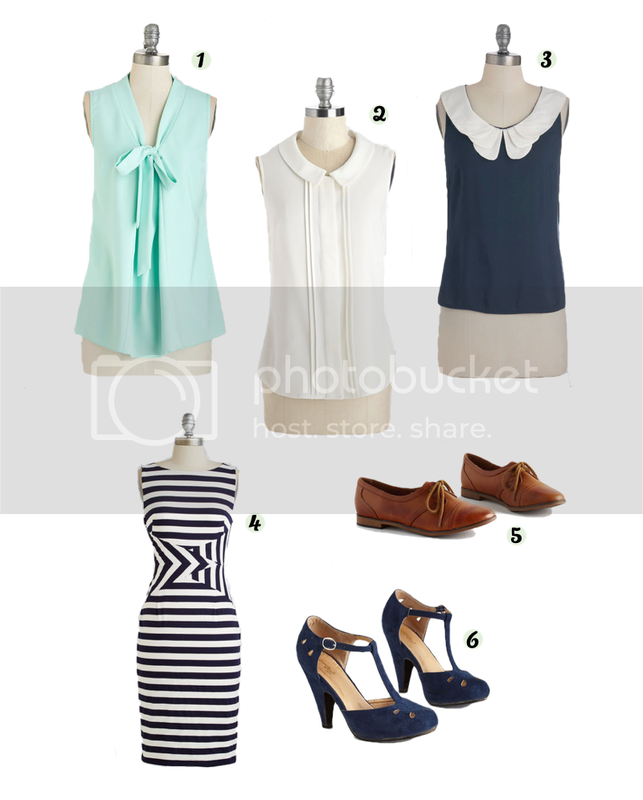 I was browsing online the other day and stumbled upon Modcloth's Wear to Work collection. I love the vintage feel of a lot of the pieces, and it made me long for a job where I get to dress up again. Don't worry - I'm not quitting my kitchen job! (I love it far too much!) But I am considering adding one or two of those blouses to my closet, to fill that blouse gap. I'm also eyeing up that dress and those shoes, but those aren't on my mental list of pieces I need, so for now, they'll just live on in this wish list.